Next month’s E3 is going to reveal a lot and it’s going to be exciting to see what games will be testing the powers of the new-gen consoles. The year is almost halfway over and we’ve already seen some excellent games. Keep in mind that this list co-ranks both the games released and the potential/expectations of upcoming titles. Also many games still haven’t announced their release dates and could be pushed to 2015. This MMO role-playing shooter has had all eyes on it for some time. Bungie has separated itself from the iconic “Halo” franchise to team up with Activision and produce a game that could potentially serve as the next big step in video game technology. The budget for developing and marketing is around $500 million. Making “Destiny” the most expensive video game ever produced. This game sounds massive and has innovation written all over it, including plans to incorporate social media into the experience allowing players to stay connected offline. “Destiny’s” ambitions can often sound farfetched and outside the realm of possibility, so we’ll have to wait and see if Bungie’s new title lives up to the hype. “Destiny” will be released September 9th this year. Nintendo has fallen on some dark times. The Wii U has reportedly sold only 6.17 million consoles which is a major loss for Nintendo, but there may be a remedy for their financial troubles. “Super Smash Bros.” has arguably become one of the most widely acclaimed franchise published by Nintendo. There’s no doubt that the newest installment will be just as wildly entertaining. Announcing some new characters such as Mega Man, The Villager, and most importantly the Wii Fit Trainers, this game is already sounding strong. The only problem is that it may not even be released this year. There is no definite date for either the Wii U or 3DS games. The 3DS is slated to be released in the 3rd Quarter of 2014 and the Wii U version in the 4th quarter. Expect to hear more about these games at E3 next month. The game is an MMO third-person shooter. While not being 1st person may turn some people off it’ll still be interesting to see how the mechanics of the game play out in the third-person. Much like “Destiny,” “The Division” promises to incorporate online multiplayer into the primary campaign. Ubisoft announced recently that the game will be released for the PC as well. Expect to see the game on shelves in the Fall. Another potentially strong Ubisoft title coming soon is “Watch Dogs.” The game will be released on May 27th so we will be hearing about how strong this game is soon enough. The game received over a combined 173 pre-release awards and nominations for its displays at E3 2012 and 2013 including 3 awards and 4 nominations from the Game Critic Awards. The storyline is built around the concept of “information warfare.” The gameplay mechanics allow you to hack into and control various electronic elements throughout the open world. What’s more interesting is Ubisoft Montreal’s use of a new engine called “Disrupt” built specifically for the game. The game will be released on PC, the previous generation consoles, the new generation consoles, and (surprise) the Wii U. 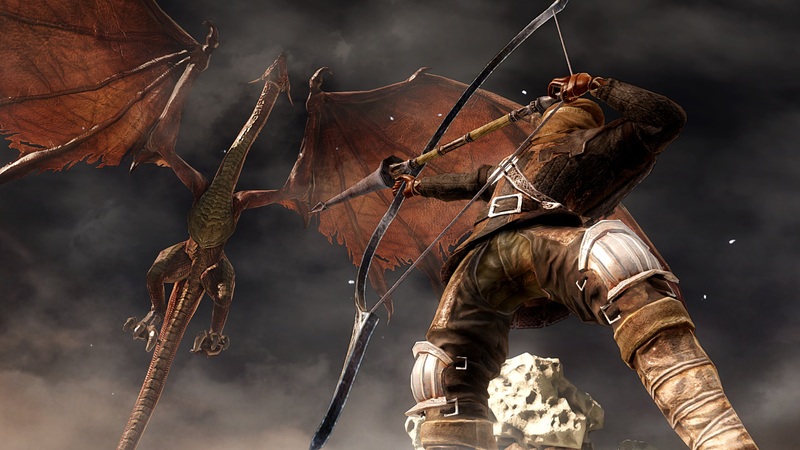 “Dark Souls II,” as of now, holds the highest score on MetaCritic for 2014. Unless something can dethrone it, it looks to be the primary candidate for the best game of the First half of 2014. Scoring a scorching 91 on MetaCritic, the action RPG struck critical gold. The atmosphere is gorgeous and the open world is constantly delivering new obstacles for the player. There is simply nothing out there like it. “Dark Souls II” was released in March for PlayStation 3, Xbox 360, and later on in April with upgraded graphics and improved 60 frames-per-second quality for PC. At this point there are still many games that can beat it, but it seems highly unlikely that this game won’t be a contender for “the best” by the end of the year. 3 of 5 episodes have been released for this Telltale franchise. Telltale games previously earned multiple “Game-of-the-Year” accolades in 2012 for “The Walking Dead.” “The Wolf Among Us” is based on “Fables” an award-winning comic book series from DC Comics and Vertigo. MetaCritic averages the first episode with an 85, the second with a less optimistic 76, and the third with an 83. As one entity “The Wolf Among Us” has been building-up to what may be a strong climax and conclusion. Much like Season 1 of Telltale’s “The Walking Dead.” The world and characters are intriguing, the decisions and consequences apparent, and the story is grim and at times poetic. It’s an easy world to get lost in three hours per episode. If the final two episodes ride the build-up forward, we can expect great things from the remaining episodes in this story. “South Park: The Stick of Truth” wasn’t revolutionary, but it was a great time. Scoring a solid 85 on MetaCritic, “South Park: The Stick of Truth” made for a solid short-term, single-player RPG. Some complained about the games short runtime and how the game could at times become repetitive, but all of this is remedied by one of the funniest, most shocking, and raunchiest storylines in the history of video games and of the franchise. “South Park” prides itself on pushing the buttons of controversy. The game is uncensored and contains some of the most graphic, borderline pornographic content you have ever seen from the franchise. It isn’t a masterpiece, but it won’t soon be forgotten. From the trailers it seems like “Inquisition” may not convert the unconverted, but for the fans out there it looks to be everything desired. The game will be released on October 7th on PC and both last and this generations’ consoles. Many publications named Telltale’s “The Walking Dead – Season 1” best video game of the year back in 2012. Some people complained that the five-part series wasn’t as much a game as it was an interactive mini-series. The game expanded upon the storytelling aspect of the medium by implementing decision-making and consequences that echoed throughout the series. Season 2 of “The Walking Dead” does what Telltale does best – manipulating the audience into feeling guilty for making a tough decision. Season 1 ranked on MetaCritic as follows: 82, 84, 87, 81, and 89. Season 2 is off to a similar start with an 80 for the first episode and an 81 for the second episode. With Episode 3 right around the corner it certainly feels like Clementine’s character arch is growing. We’ll have to wait and see how the rest of the episodes play-out, but Telltale is off to a very strong start. With 343 Industries dedicating a lot of ambition to producing high-quality “Halo” games, it’d make sense for the next installment to be pushed back a year. Connor’s comments are reassuring, it seems like 343 is putting a lot of backbone into keeping this franchise relevant and afloat. Let us know if we missed something big!